I’m appropriately re-launching the site for Pi Day. And obviously we’re going to have some pie. 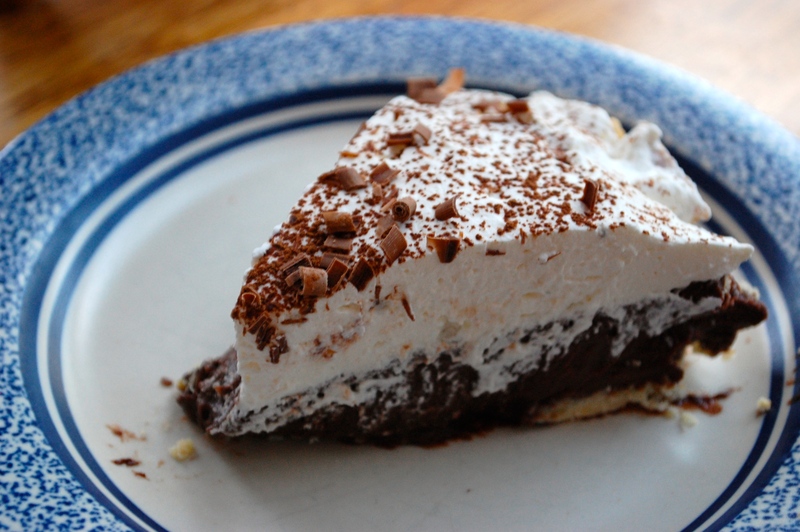 Chocolate cream pie is the underdog of pies, if you ask me. When you walk into the grocery store, it’s always wall to wall apple pie, cherry pie, lemon meringue pie, peach pie… you get it. And maybe wall to wall was slightly over the top. 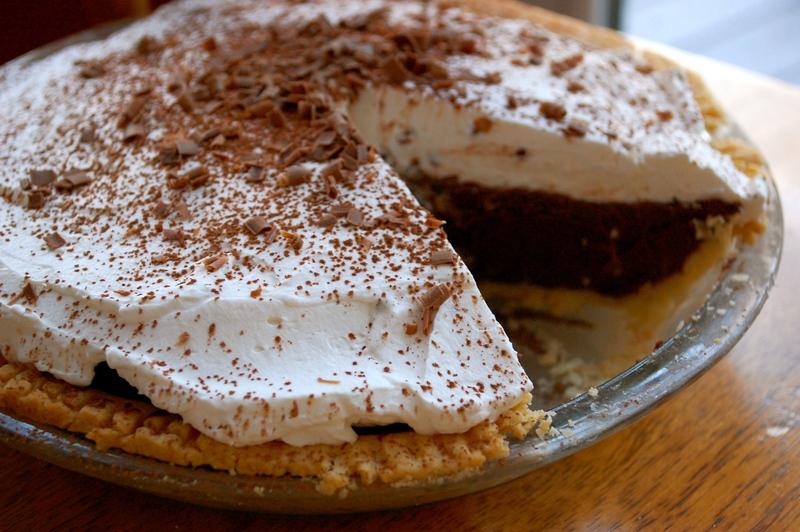 But, when was the last time you walked into a Shop Rite and saw a chocolate cream pie? You can’t remember, can you? Because it’s the forgotten pie. Everyone loves an underdog. Rudy, Harry Potter, Forest Gump, Jack from Titanic, Chocolate Cream Pie. They all have one thing in common, they’re the schmuck you disregarded until one day, they were given their time to shine. I mean, things didn’t turn out to hot for our dear Jack, but everyone else made out pretty good. 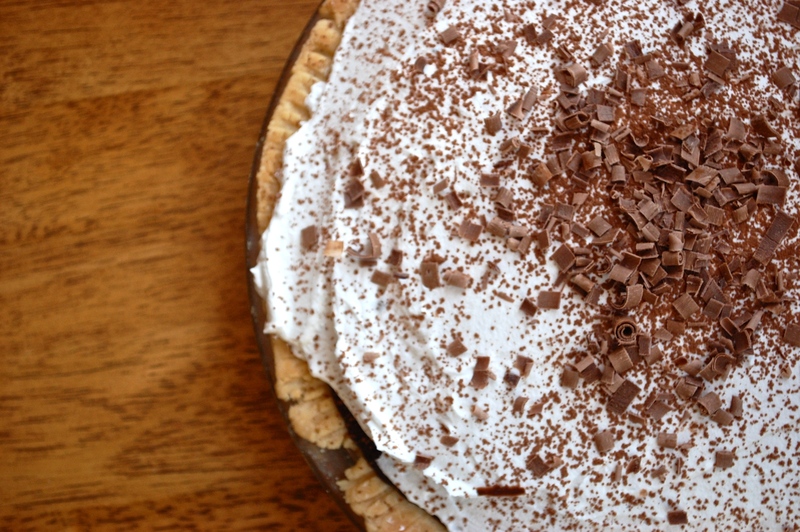 Today is the day that Chocolate Cream Pie enters its glory days. 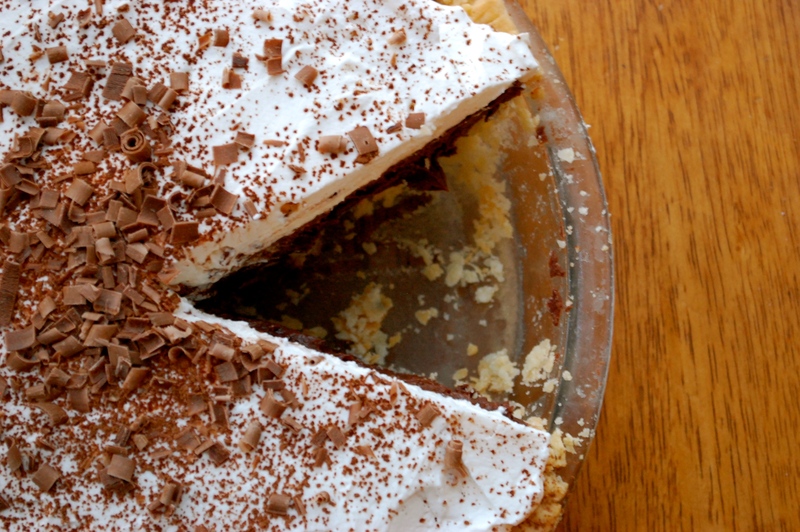 So let’s talk about this chocolate cream pie. First of all, I have 0 self control with chocolate. After some extensive online research, about 20 minutes, on the subject of chocolate cream pies, the dairy to chocolate ratio just didn’t sit well with me. 5-8 oz of chocolate to three cups dairy? Like really? HOW DO I WANT IT? So the first thing I did was essentially double the amount of chocolate used. This is not a chocolate cream pie for the average Joe Schmoe. 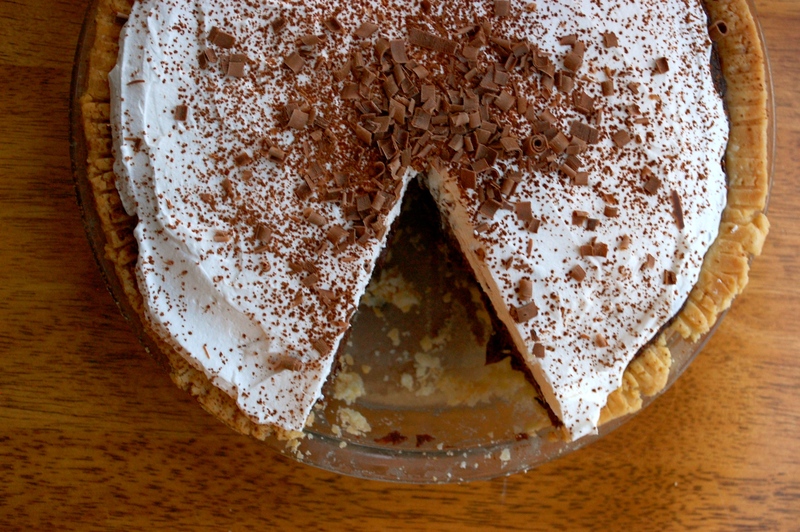 This is a super dark, super thick, super rich and creamy chocolate cream pie for the guy who isn’t afraid to face the fact that he may need to wear sweat pants for the next week after eating this pie. Because you probably will need to wear elastic for a while, so buckle up baby and grab a fork! Guh… Look at that. Let’s get cooking. For the Crust: Whisk the flour and salt together. Add in the cubed cold butter and shortening and work together with a pastry cutter, or hands, until it it looks like crumbles (like cornmeal). Then, add in an egg and vinegar and mix together until combined. Add in cold water one tablespoon at a time until the dough just comes together. This will make enough crust for two pies. You can split the dough in half and use the one and put the other in the freezer. It will last up to 6 months in a regular freezer and up to an eternity in the Yecco freezer. For immediate use, place the one dough in the freezer for 20 minutes, or put in the fridge for at least an hour before using. Cold dough = flakey crust. Write that down. Then, preheat the oven to 350 degrees fahrenheit. Roll out your dough and place it in a greased pie pan. So the crust doesn’t rise, you will need to weigh it down. I usually cover the part of the pie that is the bottom with aluminum foil and use pie weights to weigh it down. You can use uncooked rice or beans as a substitute. Just be sure to toss the rice and beans afterwards or save it to use as pie weight again later. Bake for about 20 minutes. Then, remove the foil and pie weights and cook for another 10 minutes or so until it is just starting to turn golden in color. For the Filling: In a stand up mixer, beat the egg yolks and sugar for about five minutes on medium-high. It will turn a light yellow color. Then, add in 1/3 cup cornstarch and beat for another 2 minutes. Set aside. In the mean time, in a small pot, heat up the half and half and whole milk in a sauce pan. Once it starts to warm up, add in the bittersweet and semi sweet chocolate and whisk constantly until it melts. Once it melts, add in the vanilla, instant espresso, and salt. Mix until combined and remove from heat for a moment. At this point you are going to tempter the egg mixture with the chocolate cream mixture. Turn the mixer on high and start to slowly add in about 1 cup of the chocolate cream mixture to the egg mixture. You want to add this very slowly because you don’t want to shock and cook the eggs by adding a whole lot of hot liquid at one time. This will turn your eggs into scrambled chocolate covered eggs, which sounds totally gross even to this chocolate lover. Once the egg mixture has been tempered by the hot chocolate cream mixture, pour that back into the pot with the remaining chocolate cream mixture. At this point, you will want to constantly whisk the mixture until it thickens up. This will take about ten minutes. Once it has fully thickened, it will be like super thick pudding. If you want a thicker custard, add more cornstarch one tablespoon at a time. Once the custard is to your desired consistency, add in the butter, because you know, this custard can’t possibly get rich enough. The most important part of a good custard is its consistency. NO LUMPS! Once the custard is thick, you will want to put it through a small mesh strainer at least 3 times. I usually do mine about 5 times while it is hot. Set to cool until room temperature for about 2 hours. Then push through the strainer another 2 times. Seriously. No lumps. 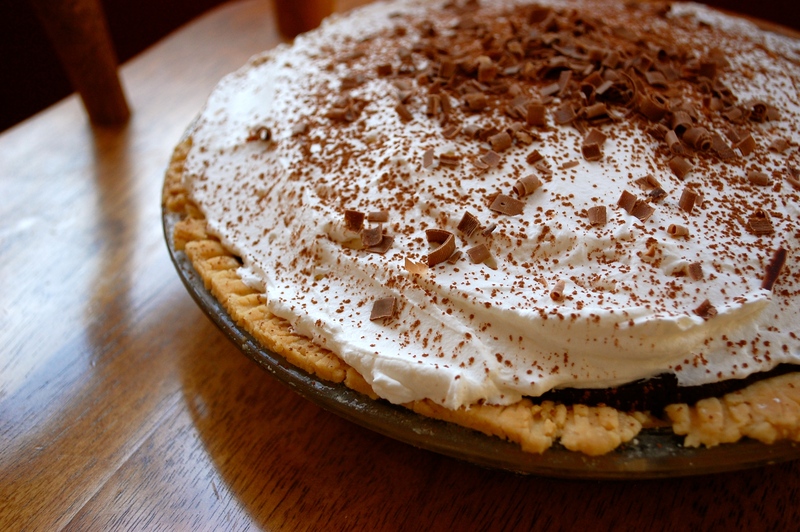 Then pour your delicious, chocolate custard into the pie crust and refrigerate for at least 4 hours or overnight. For the Topping: Once the pie is cool and set, start your whipped topping. Using an electric mixer, whisk the heavy cream on high until it turns thick. Then add in the vanilla extract and powdered sugar and stir until just combined. Don’t over mix or it will turn into butter! 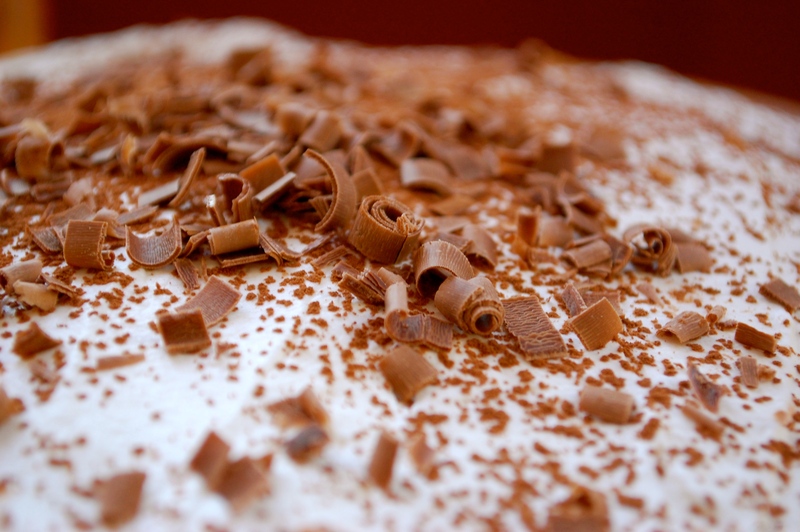 Then spread this light and airy whipped topping over your pie and sprinkle with cocoa powder and chocolate shavings. This pie with some hot tea and Netflix is just calling my name.